As a team New Haven’s average time was 18:30 and all seven runners finishing times under 20 minutes, with their top five runners who not only ran under 19 minutes but finished in the top 52, led by freshman Nathan Ford’s 27th place finish (18:02) and senior Dylan Goodwin coming in 36th (18:25). 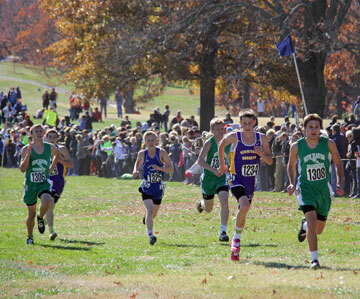 Pictured from right to left: Dominick Pataky, Jon Stone, and Kevin McDowell, passing three the runners. A key factor in the race was how New Haven’s 3, 4, & 5 (Jon Stone, Dominick Pataky, & Keven McDowell) finished the race, passing three runners in the final 50 meters, taking (Keven McDowell) 52, (Dominick Pataky) 51, (Jon Stone) and 50th. Pictured right is Kyle Brumels. 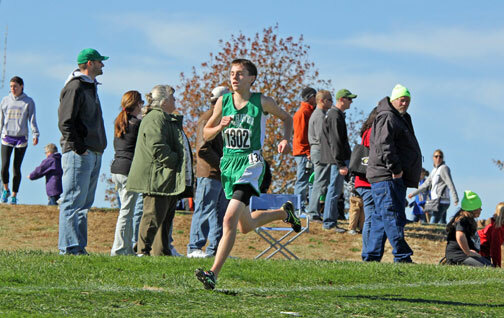 Another key difference were New Haven’s 6th and 7th (freshman Kyle Brumels and senior Cole Lensing) finishing ahead of Sparta’s 5th runner who as a team came in fifth by just 33 points. For Tucker, in his 17th year of coaching, it’s been a long time coming to have a team win a final four trophy. “I’ve dreamed of winning a final four in cross country”, Tucker said. Pictured right is Emily Lewis, finishing in 27th place. One thing Coach Tucker has been emphasizing for years is the team element and “we did this today as a team”. 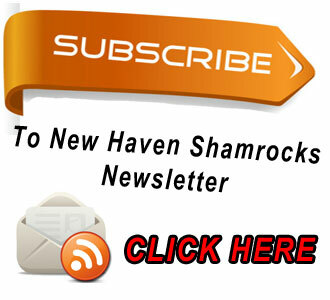 The Shamrocks defiantly ran as a team. 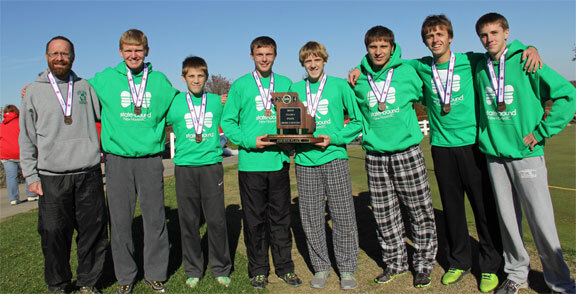 They had no one make All-State by finishing in the top 25, but running as a team is the reason New Haven was able to win fourth place and bring home a state trophy. On the girls side with only one senior (Hannah Kruse) and the other four runners being freshmen and sophomores, you can expect great things to come in the future. 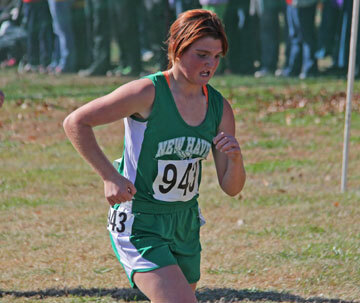 New Haven’s top three runners finished in the top 52 with two sophomore Emily Lewis just two places shy of making All-State, finishing 27th. 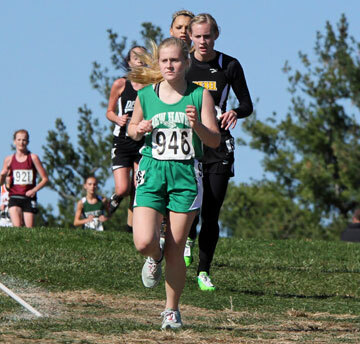 Freshman Abby Grater, despite having leg issues, still finished 31st and sophomore Lucy Roth coming in 52nd. With the girls team having only five runners, when you look at overall team scores, New Haven was just 17 points from finishing in the top seven. Pictured right: Senior Kevin McDowell giving Coach Tucker a big hug after finding out that they won the schools first ever boys state final four. A big congratulations to both teams for a great season. 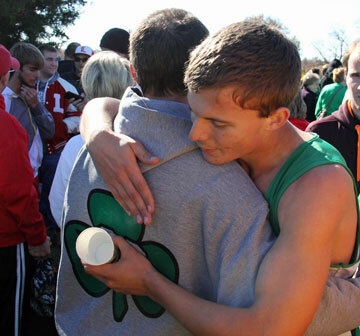 Like us on Facebook to view more photos from Saturday's State Cross Country Meet. 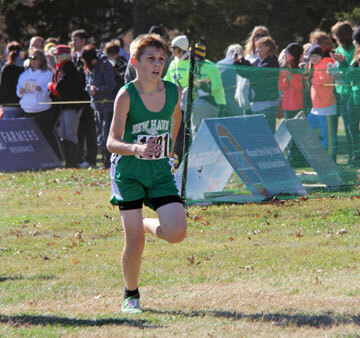 Pictured above: New Haven’s top runner, freshman Nathan Ford, finishing 27th with a time of 18:02.